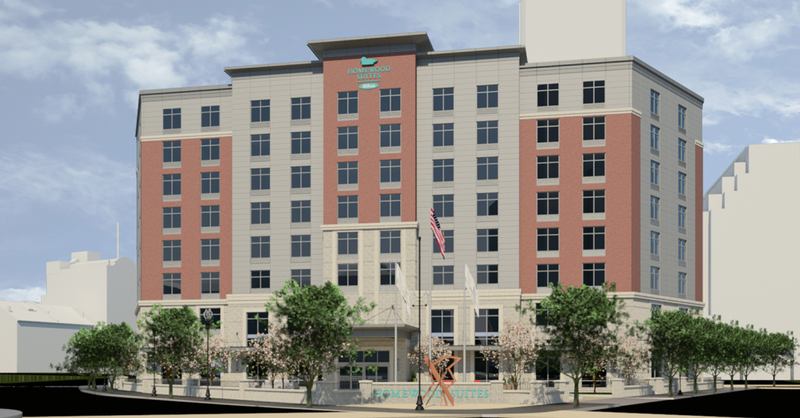 James Karam, head of First Bristol Corp., walked into a buzz saw on Tuesday morning when he showed his proposed design for an extended-stay hotel in downtown Providence to the design review committee of the Capital Center Commission. Karam’s proposal looks as if it may have the bones of a good building, but it’s not there yet. The panel members know it is not there yet but lack the desire, and the gravitas, to encourage Karam and his architect, Rolf Biggers of BMA Architectural Group, from Amherst, N.H., to move the design in a more genial direction. The triangle of vacant land Karam wants to build on, Parcel 12, is at the northeast corner of the public open space filled by Kennedy Plaza and Burnside Park. Union Station’s five buildings sit across Exchange Street and the downtown branch of the U.S. post office sits across Steeple Street. 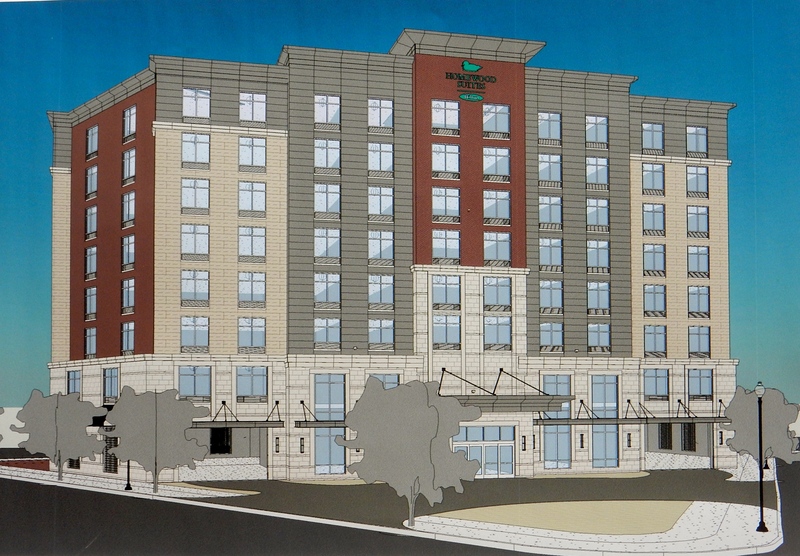 Karam’s challenge is to offer a building that fits into its space with the same grace and dignity that his Hampton Inn does over on Weybosset Street. Parcel 12 – or Bad Sculpture Park, as I like to call it – was created by the late Bill Warner as part of his plan to move the confluence of the Woonasquatucket and Moshassuck rivers from under the post office to the middle of Memorial Square – which in those days (the 1980s) was called Suicide Circle. Warner also designed the river walks and the lovely bridges and parks in a traditional style. Karam’s building would be eight stories. Capital Center guidelines for Parcel 12 require 15 stories – a number pulled out of a hat. 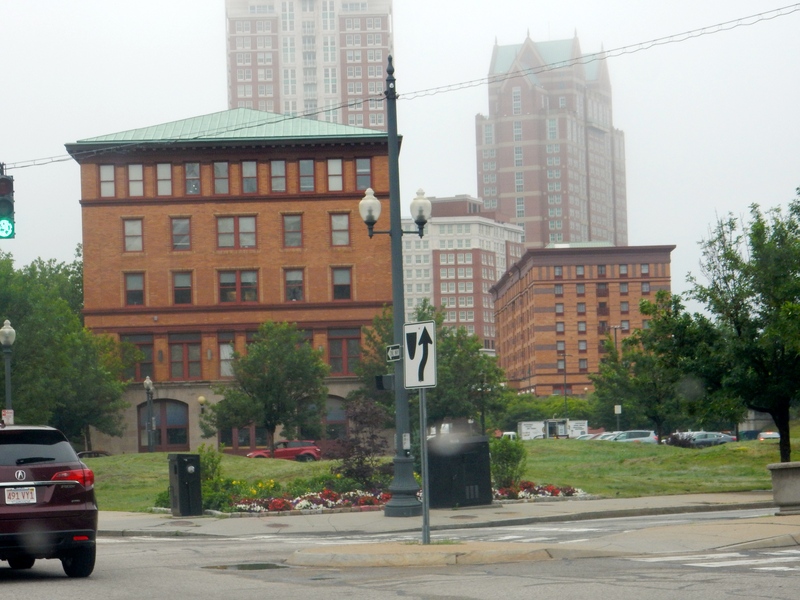 The most important facet of the parcel is the triangle’s gentle curvature along Memorial Boulevard, which follows the curve of the Woonasquatucket River. That side of the hotel should also curve along the river. How that curve emerges – whether to pick up the edge of the post office or the stone and wrought iron railing that elegantly disguises its utilitarian facade – is secondary to the need for a curve. The two other facades should meet to form a public entrance at the corner of Exchange and Steeple; or they should be set back, like the facet of a jewel, to create a plaza of greater or lesser size before the entrance. The wiggle room among these sets of alternatives should provide Karam’s designers with enough flexibility to build a hotel. At yesterday’s presentation, his effort to resolve the difficulty of building on a triangle by dodging the simple and obvious solution of a curve in the northeast façade was rightly criticized by the panel. But the panel was useless, and predictably so, when it came to the architecture. Karam’s proposal has good bones in that it looks like it wants to be a traditional building that fits into its historic context. The proposed design features cornices, stringcourses, rectangular windows arrayed with symmetry along the façades, and various types of stone masonry or stone-veneer facing. But the current plan fails to live up to its own aspirations. For example, it confuses cornices and stringcourses. The multiple cornices of varied sizes and widths and heights and styles should be simplified into a single cornice at a single level of the roof edge, with a single but more ornate embellishment. Ditto the stringcourses, which should also encircle the building, separating one or maybe two sets of stories rather than “celebrating” changes in the “bumpouts” of massing. The windows should be set back farther into their façades, giving the walls a greater feeling of strength, have at least a hint of lintels, and more mullions. The masonry, which has already retreated from four to three colors, should retreat to just one or two – a rusticated base and for the upper stories a brick or stone veneer closer to the base in shade. This is very basic, fitting the building into its setting while differentiating it from its neighbors, and leaving many options for the design’s improvement. For centuries, this simple approach enabled architects to create urban settings whose buildings worked together without hindering play among various styles. But today and for the past half a century this development strategy has been anathema to most establishment architects and city planners, including many design review panels. Members of these powerful bodies tend to be modernists to some degree. They promote styles they realize most of the public dislikes, and thus they often seek to disguise the true meaning of their recommendations. Their disdain for public taste usually results in comments that are naturally confusing to the developers who appear before them. Derek Bradford, the longtime Capital Center design reviewer and RISD professor, is the local champion of modernist obfuscation. He was on the panel yesterday. You can hardly detect his dulcet British accent anymore, and he was hard to hear. But his discourse was still filled with words like “pastiche,” “function” and “punched windows” that indicate that his commitment to modern architecture downtown remains as strong as his opposition to buildings people might actually love. To that extent, Karam should listen to what Bradford has to say, and do the opposite. Karam’s proposal is the first new building to be offered for Capital Center in a long time. In pushing for modernism in a traditional downtown, even after a decade (the 1990s) when new traditional design prevailed in the district, the commission and its design panelists have shown great irresponsibility, encouraging designs (such as GTECH) that have come close to killing the appeal of Capital Center, undercutting hundreds of millions in public investment to reopen and reanimate downtown’s rivers. Cities that want to succeed should build on their strengths, which the commission has prevented Providence from doing in Capital Center since the beginning of this century. 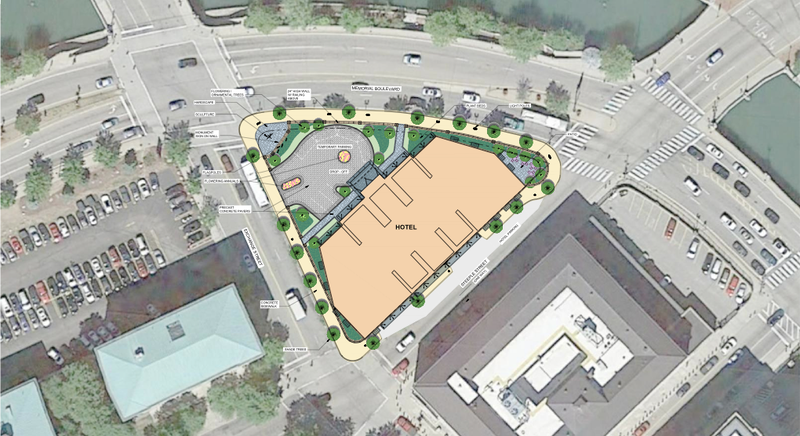 Now the Route 195 Commission is following in the Capital Center’s footsteps, and owners of the eight empty parcels that remain in the Capital Center district are trying to latch onto some of the money the state and the city want to use to encourage development on that new land. Before that happens, let’s hope the latest new building proposed for Capital Center will bring development in Providence back to its senses. Jim Karam can help. 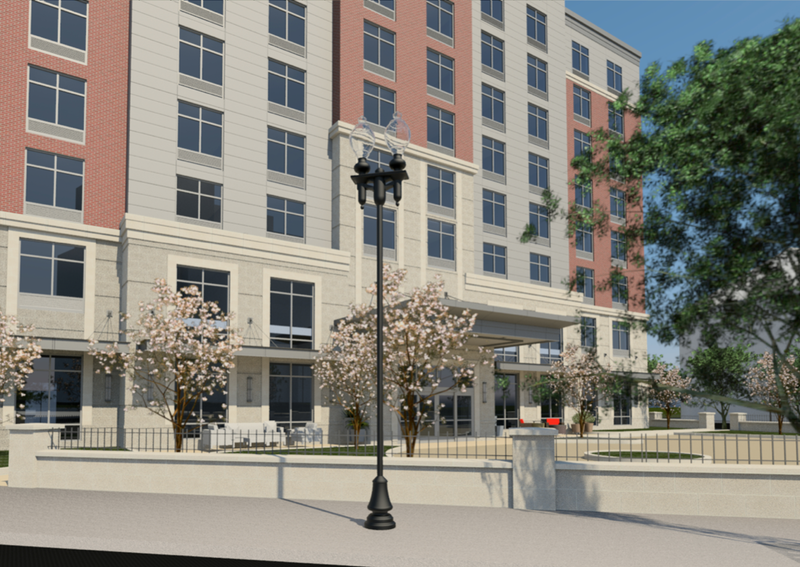 This entry was posted in Architecture, Art and design, Development, Providence, Urbanism and planning and tagged BMA Architectural Group, Capital Center, Design Review, First Bristol, Hotels, James Karam, Kennedy Plaza, Parcel 13. Bookmark the permalink. and persistence. Who would disagree? Bill, didn’t you read the piece? I’m afraid that your loathing of modern architecture has obscured your view in this case. This building may have a thin overlay of traditionally themed elements, but it remains a truly ugly design.